735 backers pledged $24,569 to help bring this project to life. Thanks to over one thousand amazing backers our first campaign was quite successful raising over $40,000 dollars. Over the past few months, while the art was being finished, I received dozens of messages from individuals asking if it was too late to become a backer. Because of the huge interest in this project, I've decided to launch this new campaign to give those who missed it a chance to join before we go into print. All the artwork is finished, and has been submitted to USPCC for approval. Once the art is approved we will be able to move forward with the printing process. Below are the five main pledge rewards. The red and blue decks share the same face cards, but have unique backs and boxes. The Limited Edition deck is unique all around. There will only be 2500 Limited Edition decks ever printed. There are only 1000 Limited decks left. Back and save your copy today. Click on the images below to enlarge them in a new tab. Kickstarter gives us the opportunity to reach further and dream bigger. With the help of kickstarter, I successfully shipped two thousand packages all around the world. Because of the amazing kickstarter platform, my game will now be published by a major publishing company next year. Bringing the Kingdoms deck back to kickstarter will help us make an even larger print run, so we may bring this amazing deck to more card collectors, families and friends. Thank you all for the support. Without it, My game, and this deck wouldn't have been possible. And thank you Kickstarter for giving me the opportunity to live this creative life. The funds raised here will be added to the funds raised from our previous kickstarter campaign to allow us to do an even larger print run. The money will also go into packaging and shipping material. Over the past year I have written over 84 kickstarter updates communicating with my backers letting them know step by step how my projects are proceeding. Dragon’s Hoard my first project has been delivered to all 1740 backers. I’m so grateful for all the support, which allowed me to manufacture and deliver a fantastic game. Dragon’s Hoard has been doing amazing. Dragon’s Hoard has been nominated for Best Toys For Kids. Further more, Tom Vasal said in his review that he’d go as far as nominate it for best artwork of the year. Because of Kickstarter, and nearly 2000 amazing supportive backers, Dragon’s Hoard is now available to everyone to enjoy. It has been such a hit that we have sold over 4000 copies so far. And even more exciting news, a major publisher will be publishing Dragon’s Hoard next year. All of this is possible because of backers like you. I have learned a lot about manufacturing, and delivering a product to my backers. It is not always easy. But in the end, I make sure I’m delivering the best product possible. The most common challenges are delays. With Dragon’s Hoard, because of the huge success and the many stretch goals, it took an additional two months to illustrate all the new artwork. The new artwork, of course, made the game much more stunning. The second delay happened when I sent the files to the printers. After I sent all the files, they kept asking me to change something, and re-send them. This process took a month, which was three times longer than expected. It was frustrating that they didn’t explain everything up front. However, now I have a keen knowledge of how printers want the files. Knowing this information has helped me deliver the files more smoothly to new manufactures. The third delay was a poorly executed proof. The printer wanted to have me sign off on a digital proof, but I refused, and said I need to see a physical proof. Once the physical proof arrived, I was glad I asked for it. It was unacceptably dark, way too dark. I took it into my own hands to print my own proof from a local printer. I then sent it over seas to my printer so they could use it to match the lightness. This worked perfectly. The next proofs they sent me were beautiful. Our fourth delay was because the printer held the game for two months after I signed off on the proofs before they even started printing it. This was by far the most frustrating challenge. The printer quoted a three-month turn around, but ended up taking more than twice as long to fulfill their promise. The last and final challenge was shipping out so many packages. I first was packing 50 packages a day and taking them down to my local post office, which only had one or two font desk workers. I would stand in line for half an hour before I’d even get to the front desk. Then I’d spend the next hour handing packages to the post officer. I did this for weeks. This was not working well. It was taking way to long. I started looking for other ways. I then found Endicia. It is a great online program where one can print your own shipping labels. This saved me so much time, and allowed me to deliver tracking numbers to my backers. In the end, I’m grateful for the amazing support of my backers, and their understanding. I’m confident that my projects in the future will be done more efficiently using the skills I’ve learned over the past year. My second project: Kingdoms of a New World raised over $40,000. The art has now been finished, and has been submitted to the printers for approval. Once approved, we will be moving forward with the print run. 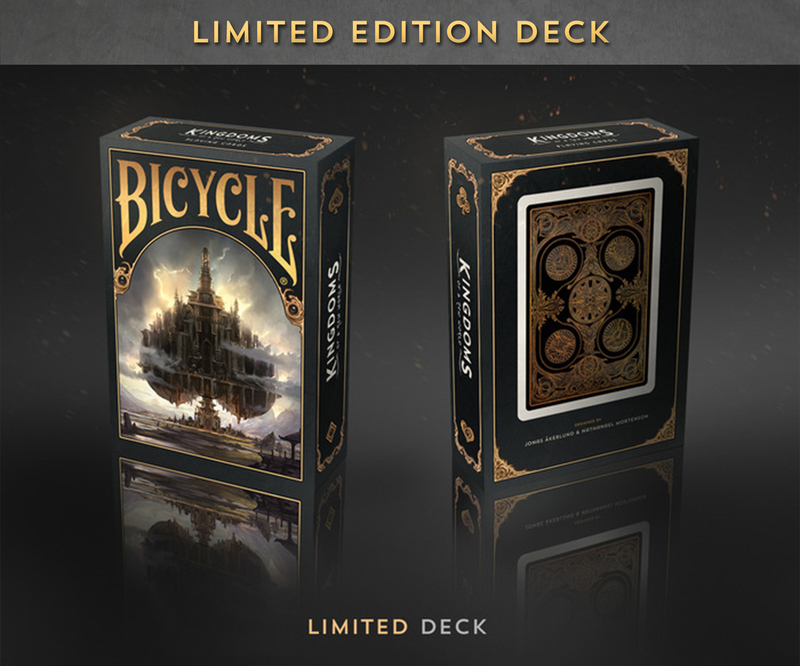 And my third project Steampunk Deck of playing cards is right on schedule for it’s estimated delivery date. Thank you for supporting Kingdoms of a New World! 1 blue deck, plus 1 red deck. One of Each: 1 Limited Edition deck, 1 blue deck, and 1 red deck. Special Bundle Price: 2 Limited Editions decks, 2 blue decks and 2 red decks. Bundle: 3 blue decks, and 3 red decks. Brick with Limited Edition: 4 Limited Editions decks, 4 blue decks, and 4 red decks. Brick: 6 blue decks, and 6 red decks.